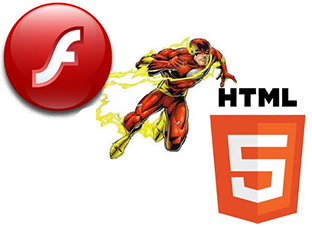 In the mobile technology wars, it’s been a war between the technology of Adobe Flash versus HTML 5. This has been a long going–at least in Internet years–battle royale that has been going on for a while, but it appears that a break has finally happened. Recently, Adobe made the decision to end the support of Adobe Flash in Google’s latest Android OS, aka “Jelly Bean.” The significance of this is huge. To some, this is a surprise. To others, it is not. Flash has been the driving force of web animation for a couple decades now on many websites globally. It is a huge part of Adobe’s repertoire, and yet… Flash has had a difficult time making it into the mobile realm. Just in the desktop/laptop realm, a Flash player can be rather unwieldy. There seemed to be only one flavor of Flash made for 32-bit machines, and not for 64-bit machines (like my own) which are becoming more commonplace. Flash programming is an art unto itself as well. As much as many employers want people to have Flash backgrounds as technical communicators, I’ve also been told by developers to not bother learning it unless I really was dying to know, because it was rather complex even for the experienced developer to use, and developing Flash was time consuming. This was all brought to the forefront about two years ago by the late Steve Jobs who said that Flash would not last, and that HTML5 was the future. He believed this so much that all of Apple’s new mobile products supported HTML5 from the get-go, but not Flash. Aaron Silvers reminded me of this when he posted this article from Business Insider, STEVE JOBS WINS: Adobe’s Ditching Flash, today on Twitter. It’s been a huge deal as iPhones and iPads proliferated with HTML5-friendly browsers, and didn’t support Flash, while other browsers for other tablets, like the Kindle, Nook and other Android-based tablets and phones did. Adobe’s had a hard time with this, as far as I could see. Just for the record, I love Apple products, but I also love my Adobe products as well, so it’s been a tough debate to follow. I actually wrote a case study about it just several months ago about it, entitled, A Case Study: HTML 5 versus Flash, which discussed the history of this debate and what actions I saw Adobe–as a company–trying to make to work within this new environment that was pushing HTML5. At the time of the writing, Steve Jobs had just passed–literally within days of when I wrote my first draft and final draft of the paper–and so much was out in the media about the great Steve Jobs and how he was the mastermind that he was. I still love Steve Jobs, but after all, he was still human and fallible, so I wanted to show how Adobe countered his attacks against Flash. In the end, the conclusion at the time was that HTML5 was the future, but it wasn’t completely NOW (or at that moment). HTML5 needed more development, and in the meantime, Adobe would adjust with the HTML5 revolution with its work on the Adobe Edge product and bringing that capability to its development products, but in the meantime, Flash was still working on most of the machines in the world, and there was no reason to stop working on that as well. The way I saw it, Adobe’s point was that you don’t just abandon a long standing technology that’s worked so well overnight, just because the next best thing is starting to come along. It’s like abandoning DVDs just because Blu-Ray disks are out. There has to be some sort of legacy transition, and until HTML5 was more mature and used by those other than the developers at Apple, it didn’t make sense to abandon Flash altogether. But in the meantime, time needed to be taken to start working with the new medium and figure out the best way to move forward. Fast forward to now, about six to eight months after I wrote the case study above. Mobile technology continues to explode on the market, and the race is on to be the dominant technological mobile device with new tablets and smartphones being introduced. RJ Jacquez posted this article that came out today on Twitter: Adobe: Web standards match 80 percent of Flash features. Arno Gourdol, Adobe’s senior director of Web platform and authoring, was quoted at the Google I/O show, referring to HTML5’s capabilities at this stage, “I think it’s close to 80 percent.” Seeing the writing on the wall, it’s obvious, after reading the rest of the article, that Adobe has been making efforts to keep up with HTML5, and make forward progress on using the web standard. Adobe’s not quite there either in keeping up, but it seems that it’s starting to make significant progress in this direction. This is an important issue to follow, because it’s not the mobile technological devices that need to be watched as much as how they will be programmed and used. Flash isn’t gone yet, but seeing what will happen with it, and where and how HTML5 progresses will be a hot issue for some time to come–so keep on top of this! This entry was posted in Uncategorized and tagged Aaron Silvers, Adobe, Adobe Flash, Adobe Systems, Android, Android OS, Apple, e-learning, Flash, Float Mobile Learning, Google, Google Jelly Bean, HTML, HTML5, iOS, iPad, IPhone, Jelly Bean, Learning, m-learning, m-learning tools, mobile, mobile learning, RJ Jacquez, single sourcing, singular experience, smartphones, Steve Jobs, TechCommGeekMom, Windows, Windows 8. Bookmark the permalink.